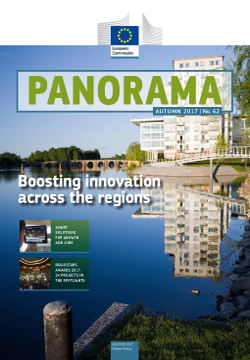 The autumn issue of Panorama focusses on innovation. An interview with Commissioner Corina Creţu gives us the state of play and next steps in preparation for post-2020 Cohesion Policy. Our in-depth regional feature showcases North Middle Sweden, where traditional manufacturing industries are disappearing to make way for a more modern knowledge economy. Smart specialisation strategies have helped them identify areas for growth, and we feature a series of projects which have benefitted from this new approach. Smart specialisation is also treated in more detail in an article on the Commission's recent Communication, laying out the future of the strategy, and contributions from stakeholders across the EU show how it is already bearing fruit. A recent report by the World Bank on doing business in Bulgaria, Hungary and Romania compares these Member States' business-friendliness with other countries around the world and makes recommendations for improvements. We survey the main findings. We also list the finalists for this year's Regiostars awards, profile four more Interreg Volunteer Youths, ‘In Your Own Words’ includes contributions from Finland, the Czech Republic, Portugal, Italy and Latvia and the picture spread points the camera at project across Sweden.